politics | What the Hell's Going On? Uncle Sam, in our kitchen. For example, some argue NYC’s crusade for better health is unwarranted. From mandating the labeling of menus and restricting trans fats to attempting to limit soda size, critics claim the Mayor’s office shouldn’t restrict choice. In response, advocates site the burden to taxpayers when consumption of certain foods results in increased healthcare costs paid for by the taxpayers. On various levels, the U.S. Government has been involved in the food system for well more than 100 years, i.e. the USDA since 1862, the FDA beginning in1906 (due partly to public outrage after Upton Sinclair’s book The Jungle) and the Farm Bill. The first Farm Bill was signed into law in 1938 in an effort to rescue the ‘market’ that failed both the producer (farmer) and consumer (eater). In the decades leading up to 1938, there were lots of booms and busts, but mostly booms. Repeated surpluses lowered prices farmers received for their crops, motivating them to plant more just to make the same amount of money. In the process, windbreaks were ripped out, and they planting where they shouldn’t, i.e. so soil erosion increased. With increasing supply, prices farmers were paid for their harvests fell further, at times to zero, and led to soil erosion and failure during the dry seasons of the 1930s, i.e. Dust Bowl. Farmers went bankrupt by the millions, partially driven by the loans they took out for labor saving equipment that helped them grow more food with less people. The surplus labor, now in the city, and without jobs and money (especially during the Depression), went hungry while tons of food went uneaten. The original Farm Bill was an effort to stabilize both prices and supply, and remained constant in theme, if not size, until a change in philosophy in the 1970s (see next slide). Renewed every five years or so, the Farm Bill and is being hotly debated in Congress (or at least in the Ag committees) in 2013. It can be argued that today’s farmers are the most productive people in the history of the world. In the U.S., after exports are accounted for, we produce more than two times as many calories as we need. Yet, the U.S. government subsidizes some of them. Most farms don’t collect direct subsidies, but, of those that do, nearly all go to corn, wheat and soy (and then cotton and rice). Most of the aid winds up with the largest producers, i.e. about 10% of the farms collect 75% of all subsidies: http://farm.ewg.org/region.php?fips=00000. Farmers (or their landlords) receive direct payments (which may be eliminated, by the current Congress) and insurance subsidies (which may be increased). Ironically, the area where these farms are located, also receive high levels of other government support, due to issues like unemployment and the resulting social problems. What do we do with what’s grown, especially since a shift in government policy in the 1970s, helped increase surpluses? Today, less than 50% of the food grown goes to feed us. More than half of the total food grown in the U.S. goes to livestock (because Uncle Sam makes grain cheaper than grass, the natural diet), to cars (mostly as ethanol, thanks to mandates and subsidies) or is wasted. Yes, we eat the animals that eat the grain, but most of what the animals eat ends up as waste, i.e. manure, methane. The U.S. government subsidizes the use of fossil fuel. It happens directly and indirectly: through tax breaks, e.g. http://daily.sightline.org/2011/07/29/oil-subsidies-and-the-us-debt-3/ and with the U.S. military (e.g. the Navy protecting the safe passage of private U.S. companies transporting oil to the U.S). Other significant costs not paid for by fossil fuel companies and the users include the damage the fuels do: e.g. air, water, soil pollution and increased human health care costs. Over the last century, farms transitioned from being diverse to specialized, i.e. growing one type of crop (mono crop), or raising one type of animal. Specialization allowed farmers to scale to gain greater efficiencies, albeit often with unintended consequences. For example, in the process of separating plants and animals, specialized farms take one solution and create two neat problems. * Manure was traditionally used as a fertilizer, replacing nutrients that had been taken by the annual crop. With specialization and scale, farms end up with excess manure (now a pollutant instead of a fertilizer), and soils in need of nutrients (solved only with large amounts of fossil fuel based fertilizer). *Wendell Berry, The Unsettling of America, p. 62. Two other consequences include: 1.Pesticide pollution: Instead of mimicking the diversity found in nature, specialization necessitates pesticide use. 2.Water pollution: Industrial farms do a poor job of retaining water, e.g. a prairie absorbs seven times the rain of a corn field, and soil, e.g. for each bushel of corn harvested, two bushels worth of soil ends up in the Mississippi River. The chemicals and pollutants deaden the soil, but they also travel with the water, damaging ecosystems far from the farm. Note: For those who don’t consider themselves to be ‘environmentalists,’ consider: The environment passes through each of us every day, with what we eat and what we drink. Our skin is porous. Our bodies consist of everything in the environment. There is more non-human living inside of us, i.e. bacteria, than human. Umbilical cords of babies have 200 industrial chemicals and pollutants in their blood (2005 Env Working Group). The single industry category with the largest labor force working for poverty level wages is the food service business. http://prospect.org/article/life-bottom. What millions of workers earn from their jobs is insufficient to meet basic human needs. These needs, and the costs, are fulfilled by government services, like SNAP (Supplemental Nutrition Assistance Program, aka ‘Food Stamps’), housing assistance, childcare and healthcare. Characteristics of Minimum Wage Workers ($7.25/hour): http://www.bls.gov/cps/minwage2011.htm. Of those paid the Federal Minimum Wage (or less), about 50% are 25 years old or older. McDonalds offers advice and financial planing to their employees, posting a website for their employees. Critics responded, exposing the reality of low wage work. Often, government policy leads to unintended consequences. Surplus corn also made its way into our food as a sweetener, i.e. high fructose corn syrup, or HFCS). Food companies discovered in the late 1970s, during the nation’s ‘anti-fat’ kick, that when sugar is added to food people eat more of it, i.e. the food. So, food was processed and sugar added. Today, about 400,000 of 600,000 packed food items on the supermarket shelves are laced with added sugar, e.g. whole wheat bread, organic ketchup, meat, yogurt, cold medicine, pasta sauce, salad dressing, soups, mac & cheese, tonic water, canned fruit, applesauce. There’s nothing wrong with sugar; it’s energy dense and we evolved to love the taste of sweetness. But overwhelming our bodies with it leads to problems. Today, in the U.S. we consume nearly 150 lbs., on average, per person, per year. Some children’s cereals contain more than 50% sugar, and food companies may spend more on the marketing of a product than the actual product. See notes on slide #17 for more. 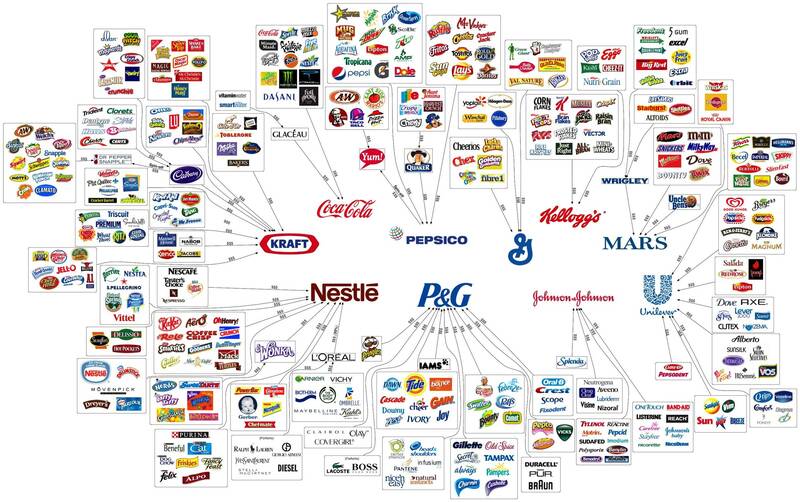 How many companies get to decide what you eat? Supermarkets stock their shelves with thousands of different items, but, if most of it comes from only a handful or so companies, how much choice do we have? Even with a global food system that has domesticated plants for 10,000 years, the majority of our calories come from just three plants (corn, soy and wheat). Most of those seeds come from just a few seed/chemical companies. Most of what’s produced on the farm is bought and traded by just three companies. The majority of the grains are processed and sold by just a few dozen companies. The majority of our beef, chicken and poultry is slaughtered by a few companies. One company controls nearly 50% of the liquid milk business. From seed to stomach, a few transnational, multibillion dollar companies control the vast majority of what we eat. Instead of limiting monopolistic characteristics and encouraging competition, the U.S. Government sponsored the consolidation of the food system. Seeds: The U.S. Supreme Court decision ruled ‘it’s OK to patent life’ opened. That, after farmers had saved seeds for 10,000 years, and U.S. Land Grant Universities had helped breed seeds, to be made available to the public for free, for generations. Now, the dominant player in the seed market, Monsanto, is a chemical company with a legacy of government contracts to produce Agent Orange and DDT. While farmers can still choose other seeds, if Monsanto seeds pollute their lands, they have to spend money to defend themselves in court (often to their bankruptcy). Food Processors: Since 1980, the U.S. government’s failure to enforce anti-trust laws has resulted in food company consolidation to the point where most markets have just a few conglomerates controlling greater than 50% of their total market, e.g. the four largest companies control 82% of the beef packing industry, 85% of soybean processing, 63% of pork packing and 53% of broiler chicken processing. Note: Companies competing for profit don’t like competition. A look at the modern ‘Western Diet:’ http://en.wikipedia.org/wiki/Western_pattern_diet, i.e. refined grains, sugars, meat and dairy. Increasingly, thanks partly to government subsidies and international trade policy, we’re exporting our diet to the developing world. Stats on our height, weight and BMI, over time: http://www.cdc.gov/nchs/data/ad/ad347.pdf Note: We are slightly taller! As a nation, diseases and premature death are attributable, at least partially, to our diet, While there are factors other than food intake in our health, e.g. 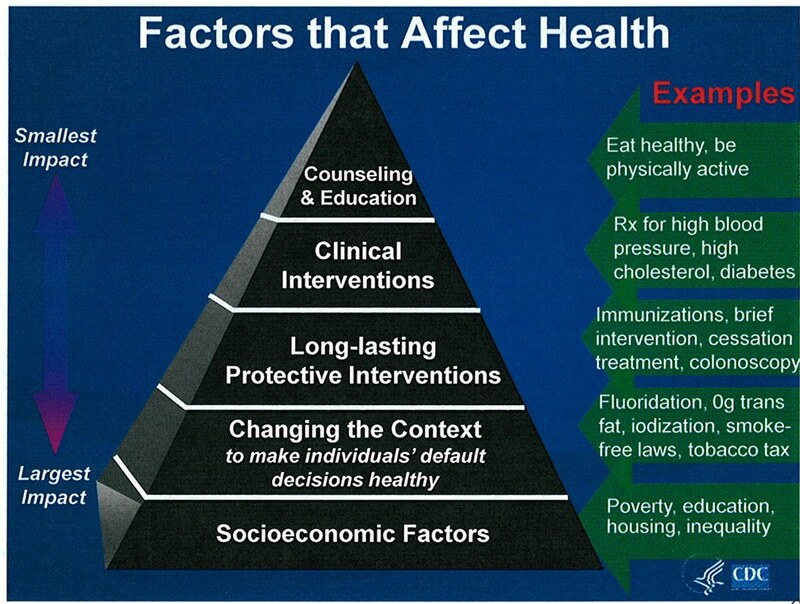 pollution, sedentary lifestyles, the majority of what we spend on healthcare goes to preventable diseases, e.g. heart disease, hypertension, stroke, type II diabetes and some forms of cancer. Note: Obesity isn’t a problem in and of itself, but it’s what it does to the body that is the problem. The government is on the hook for nearly half the total bill, i.e. Medicare, Medicaid, Veterans, and that bill is expected to continue to increase. As a nation, we spend the least, as a percentage of our incomes, on food—about 10%. Yet, because of government intervention and rules, there are significant costs that we don’t pay at the cash register when buying food. Hidden are the environmental, societal and health costs, e.g. direct and indirect payments to farmers, the right to pollute, artificially low priced fossil fuels, worker exploitation, higher healthcare costs and limited choice as consumers. Farms that work with nature, i.e. ecological farming or agroecology, understand connections and consider the whole. The farms look different in different places, but the principles remain the same: they favor diversity, reward cooperation, run on current sunshine and cycle wastes. It’s about fitting in versus changing the surroundings to suit short-term needs. The goal isn’t to maximize, but optimize. It’s not about being efficient, but being effective; not about being less bad, but being good, e.g. not reducing carbon emissions, but sequestering carbon. What about yields? How can we feed the world of 7B+ today,and 9B tomorrow? Conventional wisdom holds that large scale industrial farming is the only way, yet consider: 1. While today we grow enough to feed 12B, nearly 1B go hungry each day, because of poverty, land distribution, animal consumption, lack of political will. In the U.S., even after exports, we grow more than 2x the number of calories we need. 2. Most of the crops we grow go to animals or our gas tanks, or go to waste, 3. Industrial farming depletes, degrades and erodes soil. 4. Industrial farming requires enormous quantities of inputs, e.g. phosphorus, potassium and nitrogen (natural gas as the feedstock), oil, more water, and creates untold amounts of unusable waste. It suffers from the law of diminishing returns, i.e. the more ‘force’ you use the more you have to use. 5. Industrial farming continues to narrow the gene pool while climate change requires more diversity, i.e. crop yields will be less predictable and the narrowing of the plant gene pool limits our options to adapt to the effects of a different climate. If you’re interested in learning about international food policy, consider Food First, with experts like Peter Rosset foodfirst.org/node/246 and Raj Patel http://www.foodfirst.org/. Patel’s book ‘Stuffed and Starved’ is loaded with answers on the international food system quandry. The debate of how to feed ourselves is more than just about big vs. small and organic vs. conventional. Consider permaculture, as in permanent agriculture (part of a permanent culture), and those working on solving the 10,000 year problem of agriculture, i.e. losing the soil, or at least the productivity of the soil by planting annuals, which disturbs the soil each year). For 40 years, The Land Institute has been breeding perennial plants (think: deep roots) that grow in polycultures. http://www.landinstitute.org/ Another example is Restoration Agriculture Institute http://restorationag.org/ and Mark Shepard’s Forest Farm http://www.forestag.com/index.html. springs attest that our description of the land is true. Would we need less government ‘protection’ if we were closer to our food? Regulation exists to protect the consumer, and when the consumer resides a long way from the farmer, by physical distance or because of the number of middle-men and processors, more oversight is required. Those who leave the industrial food system provide evidence that shortening the link can offer a safer food system. Consider how fast a producer that knows its clients would lose those clients if their trust is betrayed? Chart from http://www.theeconomicsofhappiness.org/, as well as: “The number of Community Supported Agriculture (CSA) farms has also grown rapidly. The first two CSAs in the US appeared in 1986 – one in New Hampshire and one in Massachusetts. By 1990 the number had grown to about 90. But tracking the growth of CSAs in the years since has not been easy, according to Steven McFadden, author of The Call of the Land: An Agrarian Primer for the 21st Century. Part of the problem is that the USDA doesn’t track CSA farm numbers; conversely, many CSA farmers want little to do with the federal government. But based on research with knowledgeable sources, McFadden estimates the number of CSAs today at over 6,000. That represents exponential growth of nearly 25 percent annually since 1990. While both cooperatives and corporations (privately held or publicly held) offer goods and services to the marketplace, their models and goals are different. Cooperatives, in all their flavors, aim to end the 150 year old struggle between capitalists, workers and nature. The workers are owners and the business exists to serve members needs, not just to seek ever greater profits. Generally, this means they also serve the communities they’re a part (making it more difficult to externalize costs). The food movement is limited by the degree to which we’re willing to take back food prep and cooking. Over the course of the last several generations, we were sold the idea that if we let others, i.e. food companies, cook for us, our lives would be easier. Largely, that’s true. Except food companies don’t cook like us (or our grandmothers). Don’t believe me? Read the label of any frozen dinner and imagine making that meal at home. The U.S. FDA (Food & Drug Administration) leaves it up to the food manufacturers to determine what’s safe for us. It’s the ‘innocent until proven guilty’ model which leaves it up to the consumer to discover what’s safe. A different food system is possible. So, changing the food system does requires education, but education is just one part. Other factors complicate the story, but are more necessary than education. “If you can’t solve a problem, make it bigger.” -President Eisenhower. i.e. not by actually making the problem worse, but by widening the lens to understand connections so as to incorporate more components in the solution. Why should our tax dollars support farms that rely on artificially cheap fossil fuels and chemicals that kill life, to grow a surplus of commodities which become the feedstock for what worsens our health and raises our healthcare bills? Why, if the independent medical profession tells us to eat far less of refined grains, sugar, meat and dairy, does the government offer them so much support? Why are farmers who grow responsibly, and employ more people, charged a fee to prove their crops are free of chemicals? At the same time, these farms often have to deal with regulations designed for industrial scale farms. The U.S. government may recommend we eat ‘speciality crops,’ i.e. fruits and veggies, http://myplate.gov/, yet they give virtually all their support to that which we ought to be eating less of. So, for now, if you’re a farmer and you’re trying to ‘do good,’ e.g. to grow clean food for your community, you’re swimming upstream. Current policy supports neither liberal or conservative principles. Despite what Margaret Mead said about the difficulty in changing a diet, we’ve changed our diet and we’ve done it in a big way. Our eating habits weren’t great pre-1980, i.e. too much meat and dairy, yet, since that time, our health has deteriorated, even as we’ve mostly given up smoking. We eat more calories and different calories. We’ve become bigger and we suffer from more diet related diseases. Our healthcare costs are exorbitant. “Our diet has changed more in the last 50 years, than it did in the previous 10,000 years.” -Michael Pollan. What changed? Did our genes change? Did we become less disciplined in just the last thirty years or so? For the majority of agricultural history, our largest challenge: consuming enough calories consistently. Our bodies are hardwired for seek energy-dense calories. Until even about sixty years ago, it remained logical for the U.S. government to recommend us to ‘eat more.’ That’s no longer the case. Food companies learned something we’re just now coming to grasps with: a calorie is not a calorie. When companies put more sugar in food, we ate more of it. So, sugar went into everything, i.e. late 70’s with cheap corn processed to high fructose corn syrup. At the same time, fiber was removed (to help foods store better). Today, the average per person consumption in the U.S. is nearly 150 lbs per year. Advertising: For every $1 spent to market healthy food, $500 is spent marketing unhealthy food. Why? 90% profits on sodas and 10% profit margin on produce. See Patel, “Stuffed and Starved,” p.270. So, it makes good business sense to advertise, i.e. Fast-food companies spent $4.2 billion on marketing in 2009. On 2010 revenue of 11.8B, Coca-cola’s ad budget was more than $2.9B. Food today: It’s advertised all over the place, nearly irresistible, made to consume in quantity and easily accessible 24×7. Toxins & Stress: What if our health problems stem from more than just the food itself? Julie Guthman’s research on food and obesity begins to widen the discussion, i.e. putting more grocery stores in food deserts doesn’t solve the problem. The food service industry created jobs, but those jobs pay less than the millions of manufacturing jobs shipped overseas. Over the last forty years, total U.S. wealth and GDP grew, yet nearly all the gains went to a few at the top. To increase profits, corporations reduced labor costs, through productivity gains, shipping jobs overseas and wage cuts, i.e. with more demand than supply, workers lose leverage. The result: the middle class got clobbered and the ranks of those struggling rose. Eating well on a limited budget is difficult, partially because of government policy, and, health disparities between the ‘haves’ and the have nots’ are large. The biggest predictor of obesity is income level. Most of our response has been: ‘eat better,” even if we know it’s not the most effective strategy to improve health and lower government expenditures. Between 1948 and 1973, the productivity of U.S. workers rose 96.8% and wages rose 93.7%. Between 1973 and 2011, productivity rose 80.1% and wages only 4.2%. Share of the nation’s wealth by the bottom 50% has plummeted to 1.1%, while the top 10%’s share climbed to 74.5%. Just 400 people in the U.S. have more wealth than the bottom 50% (150,000,000) Americans. This is partially due to high unemployment (and underemployment), by some measures higher than 20% http://www.shadowstats.com/alternate_data/unemployment-charts and a minimum wage that, adjusted for inflation, is nearly 50% lower than it was in 1968 (when the unemployment rate was 3.6%). http://truth-out.org/op-ed/item/10489-the-725-minimum-wage-is-too-low-for-21st-century-america Minimum wage for tipped employees is $2.13/hr, the same for more than two decades. Half the jobs in our country pay less than $35,000 per year, http://www.npr.org/2012/08/04/158141728/how-americas-losing-the-war-on-poverty which results in most American families with no savings who live paycheck to paycheck. http://money.cnn.com/2013/06/24/pf/emergency-savings/index.html 28 million workers earn less than $9.89 an hour, or $20,570 per year. Charts, showing ‘progress’ the last few decades http://www.businessinsider.com/profits-high-wages-low-7-2013. And, according to the Wall Street Journal, the average hourly pay for a nongovernment, non-supervisory worker, adjusted for price increases, declined to $8.77 last month from $8.85 at the end of the recession in June 2009. When we have less disposable income, and less economic security, we’re more likely to purchase energy dense (with few nutrients) food. Realistically, can low income Americans afford a healthy diet? http://www.ncbi.nlm.nih.gov/pmc/articles/PMC2847733/ This leads to one of the ironies of our food system: the poorest are often the most overweight. Lower income citizens often face other challenges, e.g. worse schools, less green space/safe place, longer commutes, fewer childcare options (so the TV ends up as babysitter) exposed to more environmental toxins, lack of access/choices to healthy food, more single family households (broken by poverty). Critics of minimum wage argue that it would hurt the economy and low wage workers and that government intervention is misguided. Without government intervention, we’d still have child labor and 70 hour work weeks. Consider, 45 years ago, when the minimum wage was nearly 50% higher than today, unemployment stood at 3.6%. Employers who pay poverty level wages shift the burden onto the U.S. government. Remember: Characteristics of Minimum Wage Workers ($7.25/hour): http://www.bls.gov/cps/minwage2011.htm. Of those paid the Federal Minimum Wage (or less), about 50% are 25 years old or older. These are not ‘starter’ jobs that lead to big future earnings. Liberals fight for a safety net so people don’t starve. 240 years ago, a few revolutionaries and activists on the east coast of what is today the U.S. fought for more representative than what the King of England offered. In numerous ways our experiment in self-governance succeeded, but a 2013 Gallup poll found, ‘dissatisfaction with government’ nearly topped our ‘most important issues’ list http://www.gallup.com/poll/159830/debt-gov-dysfunction-rise-top-americans-issue-list.aspx. Even when there’s overwhelming public support in an area like limiting the amount of pollution business can emit http://www.nrdc.org/media/2013/130718.asp, why do so many of our elected leaders expend such energy to prevent it from happening? Is it just that the Democrats and the Republicans can’t get along? Are we too partisan? Could it be there are limits to our Constitution and Democracy? Or even that our elected officials aren’t as representative as they claim to be? Could the rapid and dramatic rise of money in politics over the last several decades influence who the candidates are, who the candidates spend their time with, what they spend their time doing and what they work on when they are in office? If we’re so partisan, why do some of those DC representatives of both the ‘left’ and the ‘right’ admit they have more in common than differences? When it comes to changing the status quo on things other than social issues, it’s often easy to mistake Republicans and Democrats. Yet, if we go with the flow, take part in the conventional food system without asking questions and considering the consequences, we continue to support what works against most of our interests. It’s not good for our health and well being, nor does it support other values, e.g. smaller government, more choice or better health. The charity we give does good. Most of who, and what, we support provides much needed band-aids. Yet, our efforts rarely reach the roots of the issues. Dealing with the symptoms of a poorly designed system helps us sleep better at night and it’s effective at keeping the ‘pot from boiling over’, i.e. mass unrest, but it perpetuates the problem. For example, consider the largest Food Banks. Those involved in the work of feeding the needy are great, good-hearted people, but if their board is stacked with multibillion dollar corporations, do they have any interest in altering the system? If they didn’t get the tax write-offs and the loads of good PR, would they do it? If we had less corporate welfare, how much less of a need for food banks would there be? Where do the boards of the biggest Food Banks stand on issues like subsidies to corn and wheat, minimum wage and international trade policy? We’re cut-off from the story behind our nourishment, like never before. Fewer than 1% of us are full time farmers (even many of them don’t eat any of the food they grow). We’re dependent on a ‘distant food system’ that keeps us in the dark. The few companies that feed us understand that, if we see behind the curtain, we’d lose our appetite. Unfortunately, the institutions we rely on for information have largely failed us. Schools teach in silos, making it difficult for students to understand connections. What happens in school is unconnected to what happens out of school. Rarely is what we eat and why thread through the school curricula, i.e. where students can learn reading, writing, math, science as the dig deep into issues around like food, energy, health, justice and policy. Consolidation: nearly all of what we hear, read and see is decided by six companies http://owni.eu/2011/11/25/infographic-media-consolidation-the-illusion-of-choice/. They exist because of the government’s frequencies, but because advertising revenue sustains them. Profits come first. Sports programming and Reality TV take preference over investigative journalism because they lead to better ratings, and more revenue. Should government be dominated by the industries they’re supposed to be regulating? We see the revolving door between government and business spin, and ask: Should the fox be guarding the hen house? If conservatives really want smaller government wouldn’t they cut corporate welfare? If liberals were really interested in helping the less fortunate, wouldn’t they work towards a system where fewer people required a safety net in the first place? Looking at existing policy and who it favors raises questions like: What would some of our largest companies look like if they had to pay the true cost of producing their goods and services? Could they compete in a market where they weren’t propped up by Uncle Sam and our tax dollars? If companies are breaking laws, why aren’t they held accountable? And for those doing damage legally, who creates the laws and who defends and protects them? Why is the playing field tilted towards a few, creating a system that results in big government spending? Some remain oblivious, others bury their head in sand, but the absurdity and injustice of the existing food system leads millions of people to choose differently with their consumer dollars. The alternative food system rises, through experimentation and innovation, to meet that growing demand. It’s attractive and helps to paint the picture of what’s possible. Food is a growing part of the debate, especially overseas (where U.S. policy looms large). In the U.S., from those protesting the Farm Bill, to the Coalition of Immokalee Workers http://ciw-online.org/ to restaurant workers demanding a living wage http://www.sanders.senate.gov/newsroom/news/?id=a877ce26-ca9a-4153-acc1-db0ea3b33f4b, all struggle for a fairer food system. Their stories are under-reported or misreported and the participants marginalized, but what they want is representation. They want elected officials to be held accountable to the needs of the majority. It’s no longer the left versus right paradigm we’re accustomed. It’s the individual versus multinational corporations and the elite. It’s far more than just protests. It’s more than the Farm Bill. It’s the injustices in government sponsored research that exist to make pharmaceutical giants more profitable and it’s questioning the legitimacy of advertising to kids. Increasingly, people learn democracy is a verb; they’re beginning to organize, learning from the movements of a century ago (and Civil Rights). Movements, that, with patience and persistence and action, earned women the right to vote, and convinced elected officials, at the protests of business leaders, to outlaw child labor. The movement aims to open up and make room for business that wants to compete on a level playing field. Their goal: a new reality, where ‘doing good’ can be the de facto, like swimming downstream. Sure, those who benefit from maintaining the status quo do all they can to misdirect and misinform the population, but the tide is rising. Reducing the influence of money allows elected officials to work in the interests of the majority, toward effective governance. On the surface, our two political parties fight like they’re on different teams, but it’s not as it seems. Consider who puts our elected officials in office and who they spend time with, and who they work for while in office. And who gets them re-elected. Or hires them when they leave office. The pool of candidates for national public office is limited to those who have money and those who can raise money. Nearly all the money raised comes from a tiny sliver of the population. These are the people who determine which candidates have campaign funding and then who earn early mainstream coverage and are considered viable. If the candidates message doesn’t resonate with the funders, it’s not likely they’ll make it far. Candidates and elected officials spend the bulk of their time with those of money and it limits what they know and who they hear from. It also determines what they work on and who they work for while in office (and once they leave office). Major reform, the kind that results in rules that work for the majority, on the food system or any other related issue (they’re all related) won’t happen until we get to root causes. To that end, there’s a growing movement to lessen money, and it’s corrosive influence, from politics. 16 states, and 500+ communities have called for a constitutional amendment to overturn the Citizens United case. While election reforms, e.g. ‘Fair Elections,’ do have bipartisan support in Congress, the total number of supporters remain in the minority: http://www.commoncause.org/site/pp.asp?c=dkLNK1MQIwG&b=4773857. “There are two things that are important in politics. The first is money, and I can’t remember the second.” -Mark Hanna, who put William McKinley in the White House in 1896 in large part because he helped raise an unprecedented amount of money–more than $3 billion in today’s economy. No crystal ball exists to tell us what’s next. And change is rarely predictable- or linear. We don’t have a shortage of food, or a shortage of ideas. We know what’s possible, and we know the roadblocks won’t be removed until we have more representation. We can affect change. By understanding connections, between food, farming, energy, health and government policy, we come to see our ‘food issues’ not as problems, but as opportunities. We come to the conclusion that the vast majority of us our on the same team and food can unite us, rather than divide us. We put food back at the center, where it’s traditionally been, to come together and to celebrate family, friends and life itself. This is the most exciting time in the history of the world to be alive. It’s chaotic. There is but one certainty: change. Change is inevitable. When it happens and what it looks like is up to you, me and those who represents us. Note: Perhaps we in the U.S. still remain too comfortable. Maybe the change will be driven from overseas. Since 2008, there have been 60+ food related riots around the world. US food and trade policy and Wall Street’s influence on the price of commodities can, at least partially, be implicated as the cause (see Frederick Kaufman for more).